In this Wednesday, May 20, 2015 photo, traffic slowly moves along the 101 Freeway during afternoon rush hour in Los Angeles. Traffic congestion is projected to become significantly worse and more widespread without big changes in how people and products get around. The possible solutions are many, but none is easy or cheap. The problem is clear: Traffic congestion will become significantly worse and more widespread without big changes in how people and products get around. Build more roads. Build more public transit. Rely on new technology. The possible solutions are many, but none is easy or cheap. Ridership on public buses, trains and subways has reached its highest level nationally since the 1950s, and transit boosters cite this as evidence that expanded service and routes is a good investment. The nation's driving capital, Los Angeles, is making a multibillion-dollar investment in building or extending five rail lines. Transit advocates say that should be a model: If LA can do it, any region can. Skeptics point out that the record ridership still translates into just a fraction of all trips people take. They also make a bang-for-the-buck argument, saying big-ticket transit projects just don't make enough of a difference to justify their cost. Driving is expected to remain the primary means of travel for most Americans. But finding the money to maintain aging highways, much less build more lanes, is increasingly difficult. To help fund new construction, the Obama administration has proposed letting states toll federal interstates. That's been prohibited since the interstate system was launched in 1956, except for a few exceptions, including highways that already had tolls. Congress would have to approve the change. 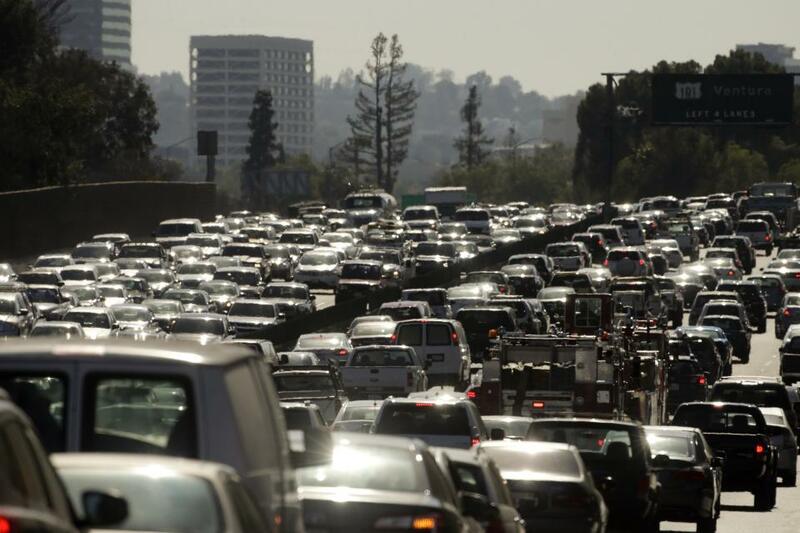 One way to make existing highways more efficient is "high occupancy toll" (or HOT) lanes. The idea often involves converting carpool lanes that may be relatively car free into lanes that solo drivers can pay to use. Carpoolers typically travel for free. Hundreds of miles of toll lanes already are operating in or around Los Angeles, Houston, Atlanta, Salt Lake City, Miami, Washington, D.C., and other cities. More tolls don't mean more tollbooths. In the future, there may be no option to pay with cash. Transponders in cars will identify vehicles, and the owner's credit card or account will be charged. Drivers already can take Interstate 95 from Maine to Virginia using one transponder so that they never have to stop at a toll booth. New vehicles will increasingly be "smart cars," equipped with wireless technology that lets them share how fast they're going, their direction, whether they're braking and whether an accident just happened ahead. These rolling networks could relay information to specially equipped traffic signals and other "smart infrastructure," which in turn would be connected to traffic-management centers. General Motors said it will put this "vehicle-to-vehicle" technology in 2017 model-year Cadillacs. Ford, Toyota and other automakers are working on the technology, but it could easily take a decade or more after smart cars hit showrooms before they replace enough older vehicles to realize their full benefits. Eventually, smart cars and trucks will be able to form tight "platoons" of eight to 25 vehicles, all electronically talking so they can closely follow each other without crashing. The University of Michigan Transportation Research Institute is setting up a mock city to test the technology in artificially dangerous situations like a truck running a red light. Automakers are already testing the technology on Detroit area highways and streets. The ultimate smart car won't even need a driver. "Self-driving" vehicles hold the potential to provide new mobility for the aged and the disabled, and reduce the demand for parking because they could be summoned by other users. In the San Francisco Bay Area, these self-driving cars of the future are an increasingly common sight. Nearly 80 prototypes have permission from the California Department of Motor Vehicles to test their skills on public roads, although a person must sit behind the wheel in case the on-board computers and sensors make a mistake. Advocates say the cars will be able to drive more closely together, as well as avoid the accidents that can snarl traffic for miles. While some Silicon Valley companies want to see these cars proliferate in the next few years, traditional automakers are taking an incremental approach by adding features such as automatic braking or lane-keeping on newer models. Traffic smartphone apps such as Waze suggest the most efficient route from A to B, adjusting along the way based on real-time speed and traffic information from other users. Dozens of transit agencies have apps that offer real-time travel information. Boston's public schools have experimented with an app that tracks how soon the school bus will arrive so parents who don't want their kids to wait in the cold too long can time drop-offs rather than opting for a drive all the way to school. If package-delivery drones like those proposed by Amazon ever get off the ground, they hold the potential to decrease the number of truck trips on city and suburban streets. Last Wednesday, I had my first experience with microtransit, when I hopped into a black Jeep Patriot that pulled up to a specified spot outside my Washington, DC, office after work. On the way home, I chatted with the driver — a friendly, bearded guy named Dean — until, a few minutes later, he got a notification on a small tablet mounted next to the dashboard. The screen instructed Dean to alter his route by a few blocks to pick up another passenger, who got in the back seat. Then we continued onward. After I got out at my house, Dean drove the other guy home on a predetermined route, perhaps picking up more passengers along the way. Through my smartphone, I was charged $4.23 for the 2.5-mile, 12-minute trip — about half as much as an Uber would have cost. My ride was provided by the new startup Split — and some people think this sort of service could be the future of urban transportation. Split is just one of a number of companies springing up to offer transportation options that occupy a middle ground between the pricey convenience of taxis and the slow, cheap service of public transit. Although there isn't a widely accepted name for these services, some people are calling them "microtransit." There are two broad categories of microtransit: One is services like Chariot and Bridj, which operate commuting shuttles in certain areas based on user demand. Then there are several services that let you split a ride with people nearby who need to get to a similar destination — including CabCorner, Via, UberPool, and Lyft Line. So far, these microtransit companies only operate in a handful of cities. But their backers hope they could one day do for public transit what Uber has done for cab rides. The idea of microtransit isn't entirely new. In New York, unofficial shuttle buses called dollar vans have quietly run for decades, carrying low-income riders from neighborhoods with relatively few public transportation options in Brooklyn, Queens, and New Jersey. But the latest wave of tech-based services largely started with a Helsinki program called Kutsuplus, which launched in 2013. This is a network of municipally owned shuttle buses that run variable routes based on pickup requests by passengers. Passengers use their smartphones to request a pickup and specify their destinations. Kutsuplus then uses an algorithm to figure out the most efficient bus to send to them, and specifies a fare for each passenger (which runs, on average, about a quarter of the price of a taxi). Once in motion, the bus might make occasional detours to pick up other passengers, but it stops much less often than a regular bus would. Kari Rissanen, director of the program, described it to me as "a new form of public transport, positioned between taxis and traditional mass transport." Most often, it's simply described as Uber for buses. So far, Kutsuplus is just a pilot program, running a mere 15 buses, and it's heavily subsidized by the Helsinki government. But the system has inspired several startups in San Francisco, Boston, and DC — including Split, which bought the company that created Kutsuplus' algorithm. The potential benefits of "Uber for buses"
The one thing that unites all these new services is that their routes are based on demand, whether in real time (like the Split ride I requested) or in the aggregate (like Chariot, which creates a new shuttle route when enough users have specified it as their commute over time). This could give them a key advantage over traditional transit. "Municipal transit agencies collect a lot of data, but they don't actually do anything with it," says David Block-Schachter, chief scientist of Bridj, which adds service areas for its shared shuttles based on where users have requested expansion. Bridj and Chariot are starting out by serving high-demand commuting routes — going from largely wealthy residential neighborhoods to commercial downtown areas. They hope that over time, they can lure riders away from public transit or driving by providing a slightly quicker, more comfortable service. It's still very, very early on. Most of these startups are only in one or two cities, and they run very limited routes. But David King, a Columbia transportation researcher, notes that if they succeed, they could help bring back carpooling, which has been falling for decades. "The transaction cost of matching driver and rider has just been too high [for carpooling to work well]," King says. "But by reducing it through technology, these companies could really open up the market for shared rides." But it's hard to say whether microtransit services will achieve mass appeal — or whether they'll end up being a cool idea that never quite panned out. One open question is whether they'll acquire enough regular riders to be able to charge relatively low prices while still turning a profit. "The key for us isn't getting two or three people on a vehicle — it's getting eight or 10 on a vehicle, which is what allows us to keep prices low," Bridj's Block-Schachter says. But to get this many on a vehicle, Bridj and other companies need passengers to be relatively near to one another to begin with, so the buses and cars don't need to be rerouted too far to pick up each new passenger. This means establishing a dense customer base. To do that, they'll need to offer service to much broader areas than they do now. As Block-Schachter says, "The more area you're able to cover, the more origins and destinations you can serve, the more attractive the service becomes." Meanwhile, Split serves a somewhat broader area of DC, but my driver told me that at the moment, the vast majority of rides are solo: The company doesn't really have enough customers for them to actually split rides all that often. Another challenge: Will microtransit be legal in most cities? These microtransit companies might also have to fight endless regulatory battles, just as Uber has over the past few years. It's an open question whether various municipal regulations will permit private companies to run this sort of semi-public transport. Some, like Bridj, are explicitly trying to work with transit agencies and have gained regulatory approval from cities before going in. Others have put less stock in this sort of compliance. Leap — a startup that ran luxury, express buses in San Francisco — is a cautionary tale. It received a cease-and-desist order from the California Public Utilities Commission in May, and though the company said it was in compliance with the law and vowed to return to service, it began selling its buses in June. Are microtransit startups actually a good thing for cities? Riders in a DC Bridj shuttle. Even if they are deemed legal, there's also the broader question of whether these sorts of startups are good for cities in the first place. CityLab's Eric Jaffe has written an excellent analysis of the pros and cons here. On the one hand, microtransit companies have the potential to reduce car use by allowing people to share vehicles more efficiently, cutting down on congestion and greenhouse gas emissions. They could also potentially help increase ridership for mass transit, says UC Berkeley transportation researcher Susan Shaheen, by solving the so-called "last mile" problem. For people in geographically isolated neighborhoods, microtransit could provide a much-needed link to subway or bus stops. So far, however, the startups are mainly serving as direct competition to transit, rather than a complement. "They're poaching high-income passengers — the people who are willing to pay a few extra bucks to save some time," King says. "This could diminish political support for public transit. And if they pull people off regular transit, the transit agency could reduce service." The fear is that by creating a segregated, two-tiered transport system, we'd be allowing for fast, comfortable service for those who can afford it — and slower, less frequent service for those who can't. King suggests that cities would be smart to try coordinating with these startups now, instead of trying to ban them or allowing them to grow on their own. Transit agencies could encourage them to operate the last-mile services that might not make sense for larger buses, providing feeder systems for high-capacity rail lines. They could also create a unified payment system for both transit and microtransit — perhaps even subsidizing lower-income passengers' rides on the latter. "There are ways to accomplish these goals," he says, "but I haven't seen any public discussion about actually doing it yet."